Neoliberalism is an ideology and a set of policy prescriptions that see competition in all spheres of economic and social life as the key to harmonious living, despite the reality that following neoliberal logic leads to the predictable redistribution of wealth to the top one percent of society. i.e. income inequality. The purpose of this article is to illustrate the connection between existing political power and the preservation of a neoliberal regime. The three examples I provide (Brexit, Scottish Independence and Greek austerity) demonstrate that the means of preserving this fundamentalist political economy are the crude tools of threat, coercion and violence. 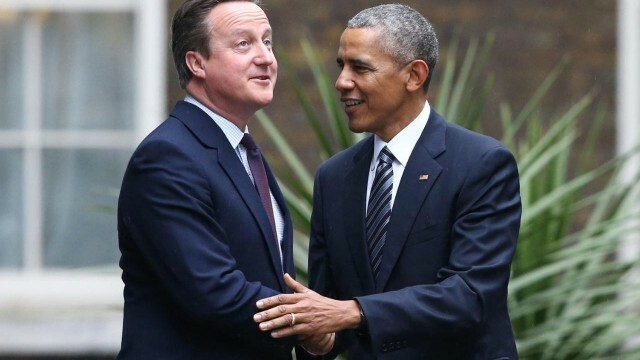 Barack Obama paid David Cameron a visit last week and dutifully inserted himself into Britain’s debate over whether it should remain in the EU. Forgetting for a moment how outrageous it is that a US president would so belligerently interfere in the domestic politics of a sovereign nation (I’m reminded of the ire that Netanyahu received when he spoke to Congress in 2015 as the final touches were being made to the Iran Nuclear Deal – oh, the hypocrisy! ), what Obama said, and why, are compelling evidence. Maybe some point down the line there might be a UK-US trade agreement but that’s not going to happen anytime soon(…)the UK is going to be in the back of the queue(…)because given the heavy lift on any trade agreement, us having access to a big market with a lot of countries rather than trying to do piecemeal trade agreements is hugely efficient. Free trade is neoliberalism’s most basic and well-known doctrine. President Obama told the people of Britain, in no uncertain terms, if they vote to leave the European Union they do so at their own peril. The United States would consider them cut adrift the international economic system. The timing of Obama’s visit to London was impeccable. Polling in early April had the “Leave” campaign even or slightly ahead. Since Obama’s visit the “Remain” position has strengthen to a 9-point lead. I think its safe to say that when the most powerful country in the world (one which controls 22 percent of the world’s economy) tells you to sit down, you take a seat. My money says Brexit is now on the dust heap of history along with all the other “exits” – and for much the same reason. The international political regime is expert in the art of threat, extortion and control through fear. This brings us to the case of Greece. The sad saga of Greece needs no revisiting. What does need pointing out are the tactics employed to get the little nation to continue dutifully paying its debt obligations to a small group of international creditors, under the weight of extraordinary austerity. Recently Wikileaks released documents that purportedly detail a conversation between high-level elites of the Troika (European Central Bank, European Commission and International Monetary Fund). The transcript suggests that retaining the Greek commitment to its austerity program may depend on the international community’s capacity to create a “crisis event”. In July 2015, as the economic maelstrom embroiled Greece, German Finance Minister Wolfgang Schäuble stepped into the eye of the storm and inferred that if Athens didn’t sign the austerity agreement they could get kicked out of the Euro. It is little surprise that confronted with the spectre of cataclysmic economic meltdown, a government that was elected specifically on an anti-austerity platform capitulated and signed an even heavier burden than that against which Syriza had run six months earlier. All three cases are remarkably similar. When a sovereign nation sought to assert its independence and decide its future according to the interests of its citizens, hugely influential global players used the threat of economic collapse and international ostracism as the means of reinforcing the current international economic regime. Does it need to said that neither the German finance minster, the US president, the RBS, nor the Stock Exchange chairperson have a sincere interest in the welfare of the Greek, the Scottish, or the British people? The interests of these political elites should by now be clear. The world we live in is not the product of accident, fate or progress. We are living in the institutional framework designed by the most powerful members of our society. These in the ruling strata are not representative of the majority; their interests are wholly different. They are inevitably part of the one percent, and neoliberal ideology (and its policy prescriptions) suit them very well. If the Panama Papers (which have curiously disappeared from the public sphere) have taught us anything, it’s that this “so-called-democracy” is little more than an elected plutocracy…to the extent that our elections are free…which, as shown by the Greek, Scottish, and British cases, they are not. So let’s refine the position. We live in an elected plutocracy where the outcome of those elections are decided by the plutocrats themselves…and this is part of the reason why neoliberalism is so hard to shake.